When I read the description, I didn't know what to expect of a short anime like this. To my surprise, the animators were able to make it work within this short time frame. 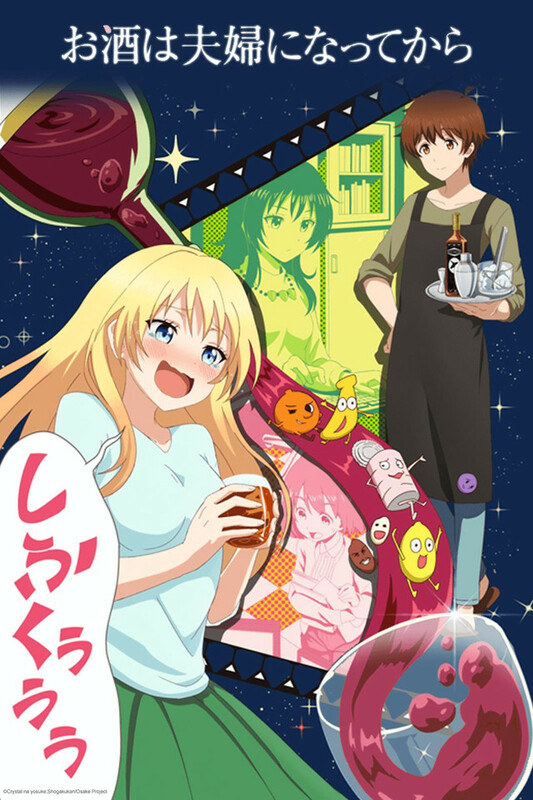 This anime is about a married couple, where the wife is a salary-woman named Chisato and the husband is a bartender named Sora. When Chisato comes home, Sora makes her various cocktails (alcoholic & non-alcoholic), so she can relax. The wife gets super adorable once drunk and only shows that cute side of her to Sora. As a result, she avoids drinking when she is out with others. This anime is very cute and sweet. The chemistry between two main characters is great and Chisato's drunk reactions are adorable. The animation quality and character designs are very good. The premise of this show is very simple, but if you just want to sit back and relax, it is perfect for you. Since this show is only 4 minutes long, I would encourage everyone to check it out. This is the best anime I have put 15 minutes of my life into, 15/10, would watch rahb get his wife drunk again. It taste sooo goooood! It taste sooo goooood! It taste sooo goooood! It taste sooo goooood! It taste sooo goooood! It taste sooo goooood! It taste sooo goooood! It taste sooo goooood! This anime is meant to be light and charming, and it succeeds in that way. You can't really blame the missing aspects of this anime because it doesn't try to be any different. It's just something to watch when your feeling down to get a good smile. As far as those 3-minute shorts can go, this was one of the cuter and more interesting ones. Like with other shows of this kind, it works best when watching the whole season in one go, rather than seeing a tiny bit once a week, but has a lot of charm either way. Unlike some people suggest, the series is not about an alcoholic - the protagonist really doesn't drink excessively, she's just a very timid, hard-working person that opens up in exaggerated fashion after having some alcohol - possibly just using it as an excuse to be a bit more emotional, as in one episode she's teased with a non-alcoholic drink and has the same reaction. Her interaction with her husband, a professional bartender, is the focus of the story - in every episode, he makes a drink of some kind and the recipe is being presented for the viewer to write down. Later in the season, the focus on drinks gets slightly weaker and we're learning about the protagonist's history with his husband and for me, this was definitely the highlight of the whole series - some seriously funny and cute moments appeared there. In the end, it's just a small, cute distraction - there's simply no place for actual depth in this formula. That doesn't make it any less fun to watch though. I have wanted for a while to find a show where two people are in a loving relationship. It's is what I asked for, a couple being cute together, no drama, just those two showing the cute stuff that couples do together. But I know that this is a pretty niche show, and it would certainly not be for a majority. But I am still giving it full five stars because this is about how much I like it.